The Powerplus was a cut above other motorcycles ... at least, so far as Indian were concerned! Their customers clearly did not disagree. Sales-wise, the Powerplus was a soaraway success. Between 1916 and '24 - the span of its production run - slight modifications were all that were needed. The Powerplus gave up 18bhp - from its 998cc engine. The result was a top speed of 60mph. 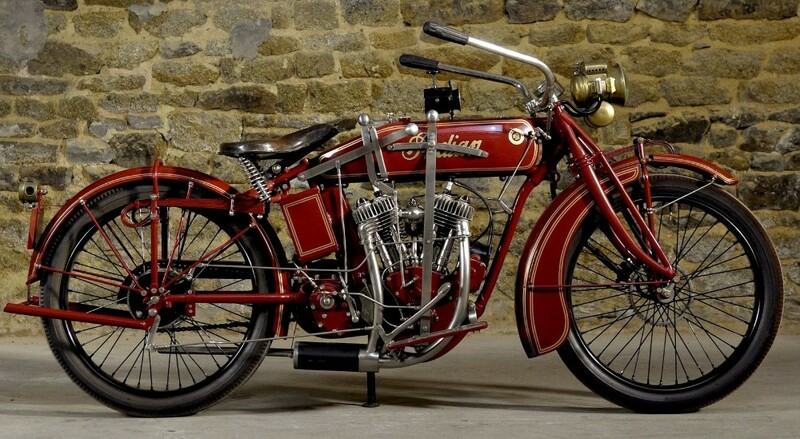 Indian entered the Powerplus in the 1911 TT. It vanquished all comers - a clean sweep of places being duly snatched. Indian were breaking long-distance records, too. In 1914, 'Cannon Ball' Baker shot across America. It took him 11 days, 12 hours, 10 minutes ... which was precision-timing, back then! The Powerplus looked superb - in its mantle of Indian red. The fuel tank was embellished with the 'Indian' script. The swept-back 'bars were a vintage delight. Old school engineering is in artful abundance. Indeed, hours would be required to fully take in the Indian Powerplus!